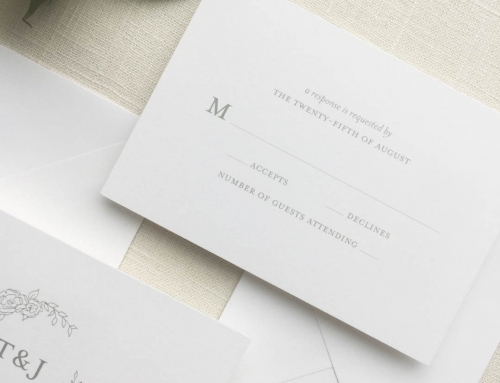 The Semi-Custom Collection is a set of beautifully crafted wedding invitation suites. These suites are available for order online and can be customized to add your personal style and incorporate your wedding theme. Read the Semi-Custom Guide for all customization options. 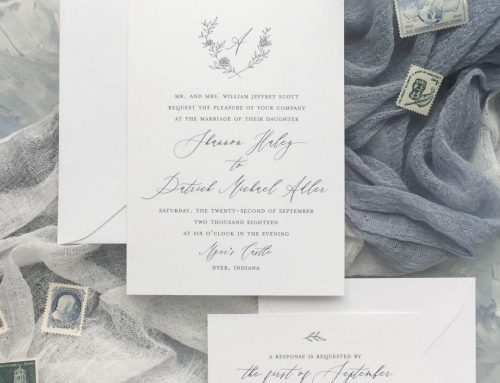 When designing this collection of semi-custom invitations, I wanted them to be a representation of my style. When I first got started, I wasn’t completely sure of what my own style even was. Even though I’m sure my style will continue to adjust over time, I know these suites are a true reflection of my skills and personality. 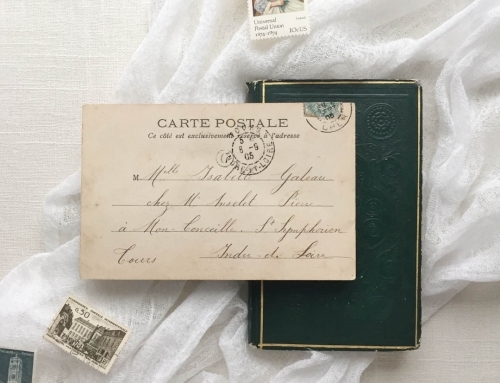 I am so excited to share a collection of suites that are a little piece of me on paper. I wanted to incorporate my own artwork, which is why you will see that each suite contains hand drawn details. 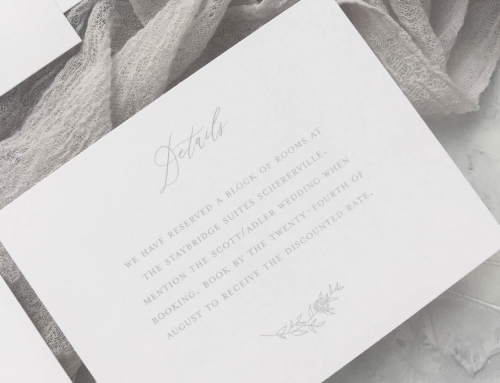 Take a look below to see each of the lovingly designed invitation suites. The Fleur semi-custom suite includes wild rose illustrations and minimalistic typography. It is perfect the for the couple looking for a clean design with a touch of romance. The Laurel invitation suite features a hand drawn laurel and complementary greenery accents throughout the suite. Pair with decked edges for a completely organic feel. 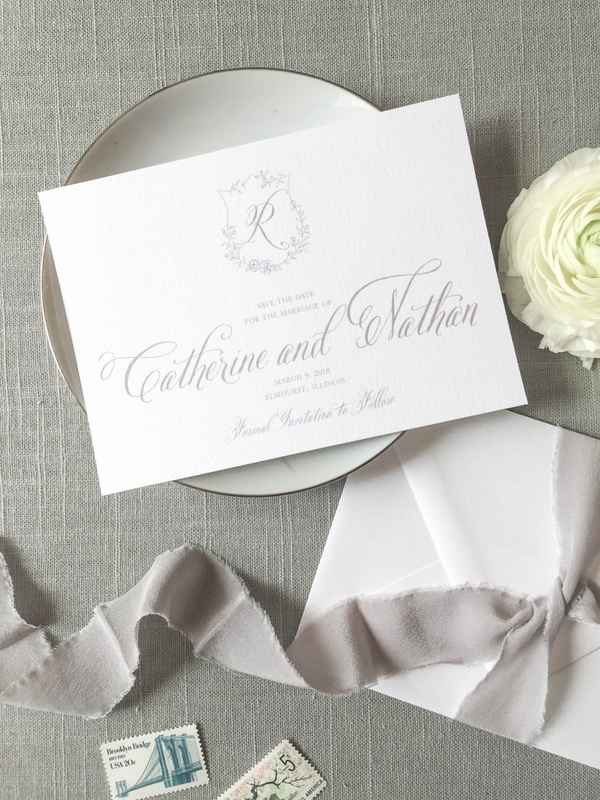 The Crest invitation suite includes a hand drawn floral crest and monogram for a touch of elegance. Customization can make the Crest Suite a traditional or modern design. The Chateau semi-custom invitation suite features a combination of delicate foliage illustrations and clean lines. This stunning design gives off a clean and poised aesthetic. You can continue to browse each of these semi-custom invitation suites and their various pieces by clicking below. If you have any questions, please contact me.